Jan Schinderle, 85, Algoma, passed away peacefully Sunday September 16, 2018 at the Algoma Long Term Care Facility. She was born July 27, 1933 in Milwaukee to Alfred and Marge (Lagerman) Neuendorf. Jan married William Schinderle October 3, 1953 in Milwaukee. They moved to Stockbridge where she worked as a lab tech at the Chilton Hospital for a short time. They were blessed with five children and of those five their daughter Julie passed away only after a few days. Jan was then a stay at home mom raising their other four children. In 1967 they moved to Algoma where William took over the Haucke Funeral Home, which later became the Haucke-Schinderle Funeral Home. Jan worked for a number of years as the Algoma Chamber of Commerce Secretary, gave guided tours at vonStiehl Winery, sang in a few choirs and helped to start the monthly Christian Luncheons. 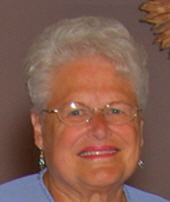 She loved to play the piano, watch college basketball, working on counted cross stitching and was an avid reader. Jan is survived by her husband Bill of 64 years, four children Steve (Nancy), Denis (Barb), Laurie Schinderle and Midge (Mike) Swedberg; three grandchildren Sara, Scott (Alex) and Sam (Taylor); two great grandchildren Alex and Will; one brother-in-law and sister-in-law Bob (Beth) Schinderle. She was preceded in death by her parents and daughter Julie. Friends may call at the SCHINDERLE FUNERAL HOME, Algoma, Friday Sept. 21, 2018 from 2:00 - 7:00 PM and after 9:00 AM Saturday at Calvary Assembly of God Church, Algoma until the time of services at 11:00 AM. Burial in St. Mary Cemetery, Algoma. The family wants to give a tremendous thank you to all the staff at the Algoma Long Term Care Facility for all the amazing care, compassion and kindness given to our mom and us during her stay there. In lieu of flowers memorials may be made out to the Algoma Long Term Care in memory of our mom. To send flowers or a remembrance gift to the family of Jan M. Schinderle, please visit our Tribute Store. "Email Address" would like to share the life celebration of Jan M. Schinderle. Click on the "link" to go to share a favorite memory or leave a condolence message for the family.